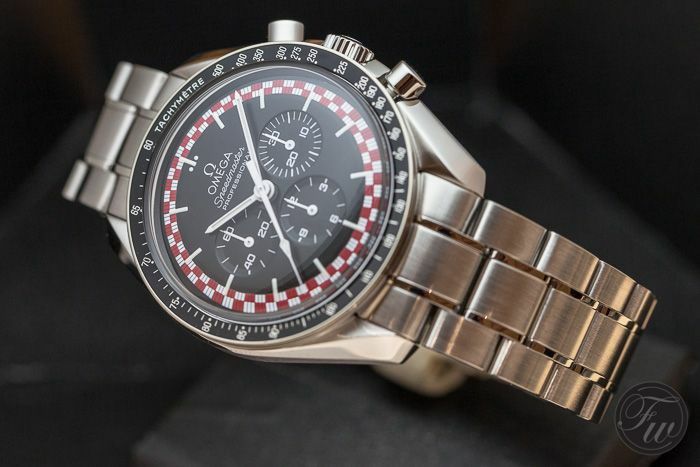 Remember our post about the Speedmaster Racing a few weeks ago? Well, there’s more to it! During our appointment with Jean Claude Monachon (Head of Product Development) of OMEGA we’ve heard the true story about the OMEGA Speedmaster Professional 311.30.42.30.01.004 ‘Racing’ that was introduced during Baselworld 2013. Tintin Destination Moon (or Objectif Lune) is the 16th comic album of Hergé’s Tintin series. It was written 19 years before the Moonlanding (Apollo 11 in 1969) and 8 years before the first manned space flight (Yuri Gagarin). The story about Tintin, Haddock and professor Calculus continues in the next album, “Explorers on the Moon” (1954). Unlike the real deal (Saturn V), their rocket stays in one piece and a flight to the Moon is just a matter of hours (instead of days). OMEGA’s Head of Product Development Jean Claude Monachon explained that the red and white design of the Speedmaster Professional ref. 311.30.42.30.01.004 was based on the colors of the rocket in the Tintin comic albums. What you don’t see on the new Speedmaster Professional ‘Racing’ is the rocket itself. The original prototype of the watch also had this famous Tintin rocket on the dial. OMEGA took the design of this Tintin homage to the publisher of these comic albums and proposed the production of a ‘Tintin Speedmaster’. The publisher of Tintin unfortunately didn’t agree with it and the plan was off the table. OMEGA removed the rocket from the dial design and decided to make this a new ‘Racing’. Now you know. Although there is a lot of Tintin merchandise (perhaps even watches), an iconic watch such as the Moonwatch would be the ideal homage timepiece to the Destination Moon and Explorers on the Moon comic albums. I am not sure why Tintin would say no to this, I can only take a few guesses. 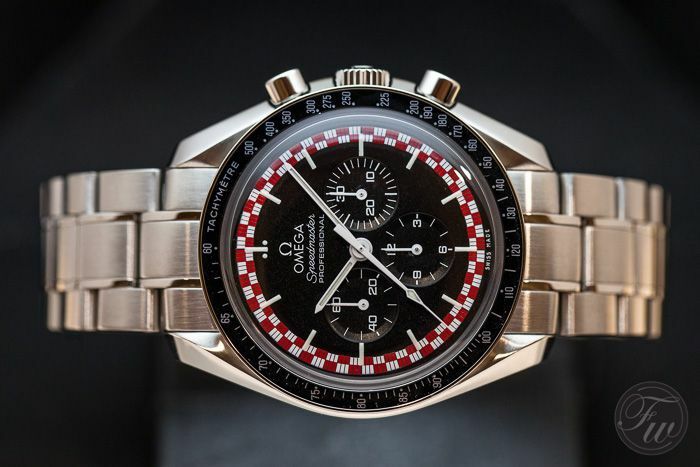 In any case, we (Team Fratello) actually like the red/white checkered Speedmaster Professional. More than we would have thought when seeing the first product picture on the official OMEGA website. Have a nice Speedy Tuesday! NOTE: I removed the pictures of the Tintin albums from this post, required by the legal department of the owner of Herge, Moulinsart SA.